I was looking through the Household Expenditure Survey 2012/13 and got a shock. 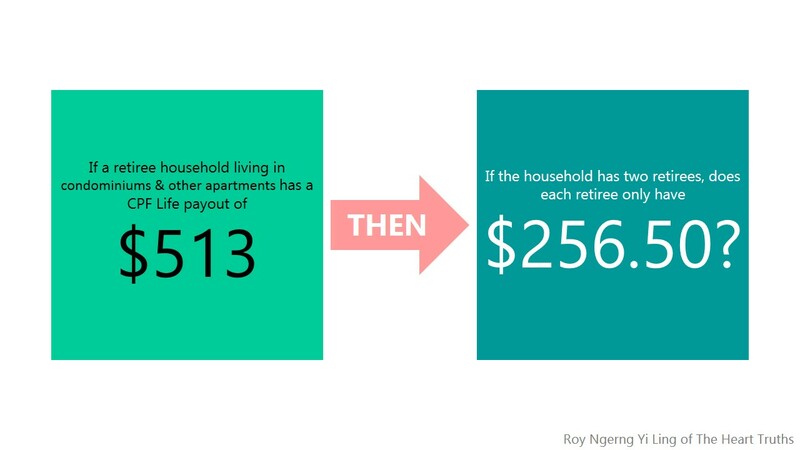 Do you know that for retiree households living in 1- & 2-room flats, their average monthly household income is only $647? Now, this is not even the worst part. 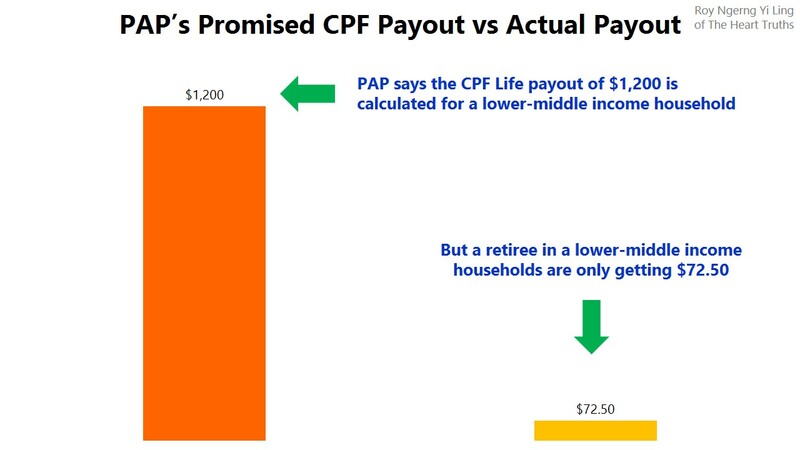 Do you know that CPF Life payouts only make up 14% of their income – CPF Life payouts only make up $93! 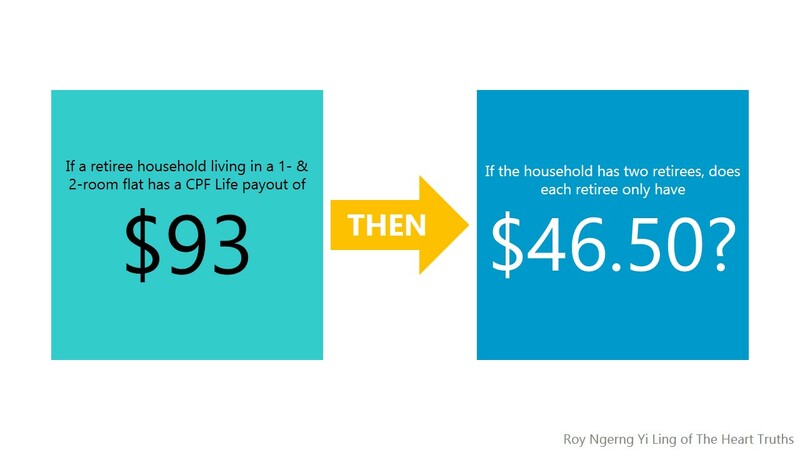 So, if the household has 2 retirees, does this mean that each person would have a CPF Life payout of only $46.50! 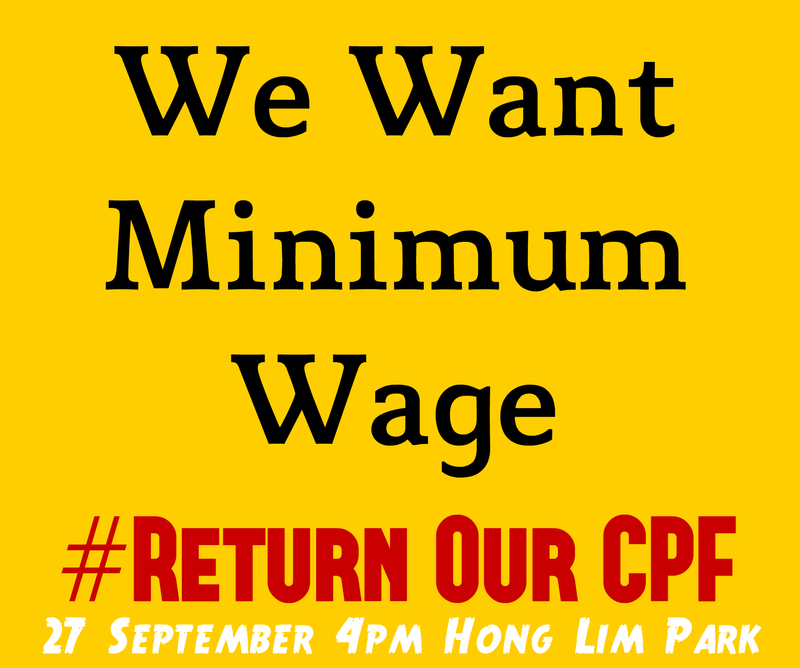 Now, do you remember how the PAP keeps saying how the CPF Minimum Sum of $155,000 would allow Singaporeans to get a payout of $1,200 every month? But when a retiree might only get as low as $46.50 every month from CPF Life, how is this even anywhere near $1,200? $46.50 is only 4% of $1,200! If a Singaporean is not able to withdraw $1,200 but is only able to withdraw $46.50, then what plans does the government has to let a Singaporean be able to have the other $1,153.50 every month? And note, many elderly do not want to sell their flats or their leases back, so how can the government increase our CPF, by increasing our wages or CPF interest rates? 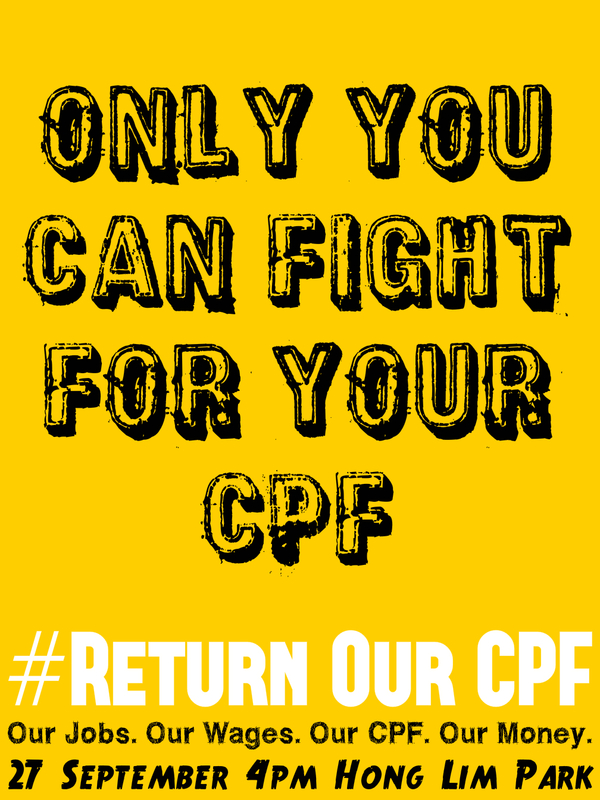 Actually, in the most basic, why are Singaporeans made to pay the highest CPF contribution rate in the world of 37% but getting back only $46.50 every month from our CPF? Can you see how, on many levels, something is not quite right? Some might think – maybe poorer Singaporeans would get back much lesser from their CPF, but the more well-to-do Singaporeans should be fine. 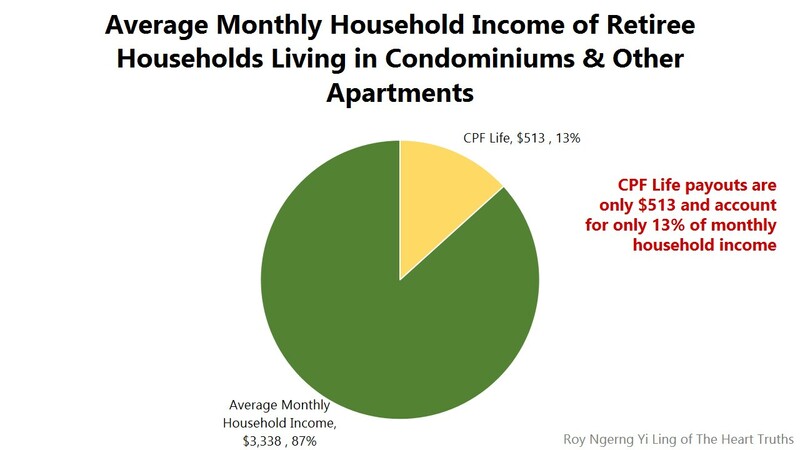 But when you look at Singaporeans who live in condominiums & other apartments, a household would only receive $513 every month. And if the households has two retirees, each person would only get $256.50 every month from CPF Life! Wait a minute! Are you saying that even for the more well-to-do Singaporeans, CPF Life only pays out $260 every month? If so, it is clear, isn’t it? 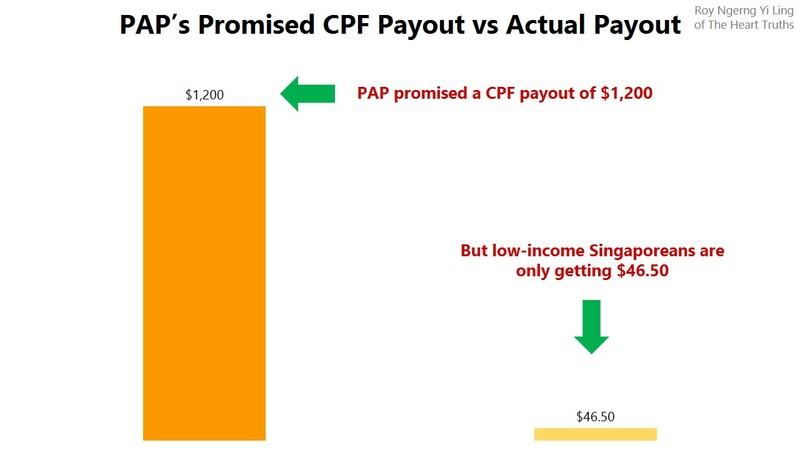 The large majority of Singaporeans simply does not have enough inside the CPF to be able to receive even $1,200 from our CPF? 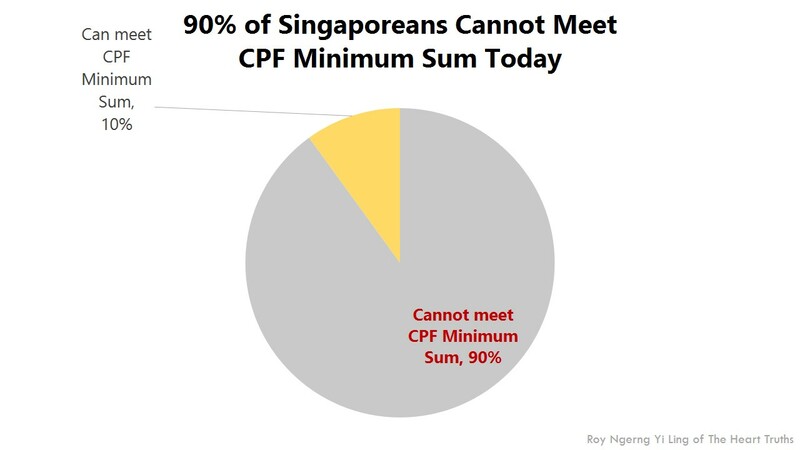 I have previously written that 90% of Singaporeans are not able to meet the CPF Minimum Sum. Looks like this is just about right. Now, PAP claims that the $1,200 is calculated to be enough for the needs of a lower-middle income household. This should mean a household living in a 3-room flat. 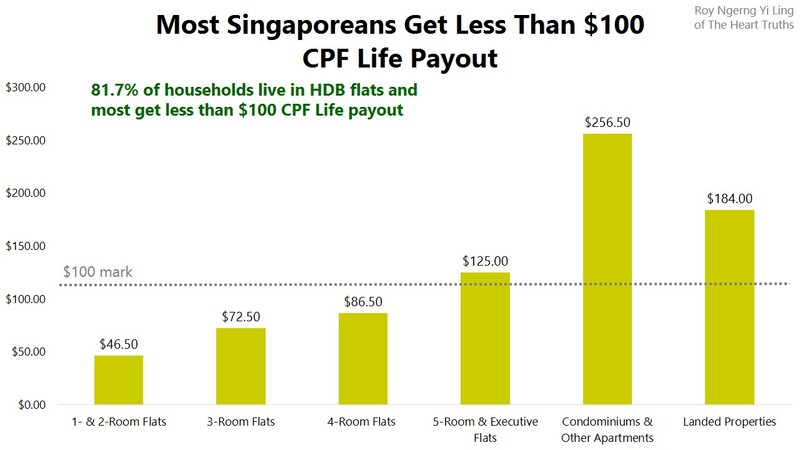 And if we look at a retiree household living in a 3-room flat, they would only get a CPF Life payout of only $145 or only $72.50 for a two-person household. If so, wouldn’t this mean that the majority of Singaporeans would only get less than $100 from CPF Life every month (if each household has 2 retirees)? Where is the promised $1,200??? Quite clearly, the PAP keeps throwing out this $1,200 figure, knowing very well that the large majority of Singaporeans simply do not have enough to retire on. And yet, when you look at the single source of income that retirees will have to depend on, it would come from “contributions from relatives and friends not staying in the same household”. This is nearly 3 times more than what CPF Life can give. 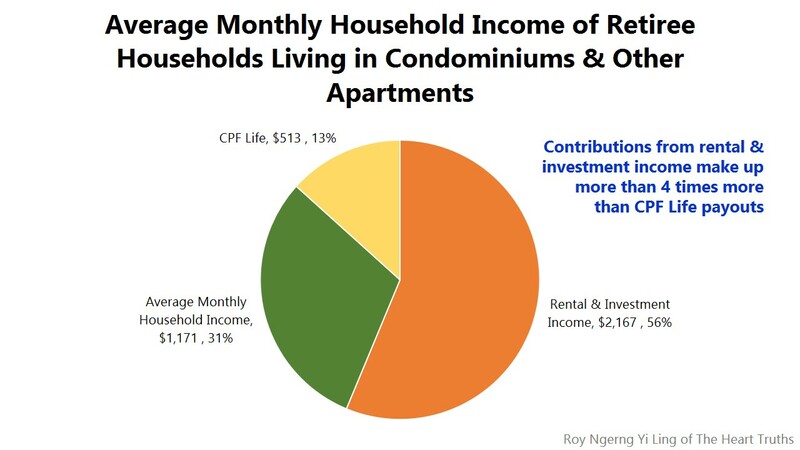 For higher-income households, this would come from rental income or investment income. For them, they would be able to do so, with more cash in hand to invest, and larger or more living premises, which would allow them to rent out either their rooms or whole apartments. This is 4 times more than what CPF Life can give. 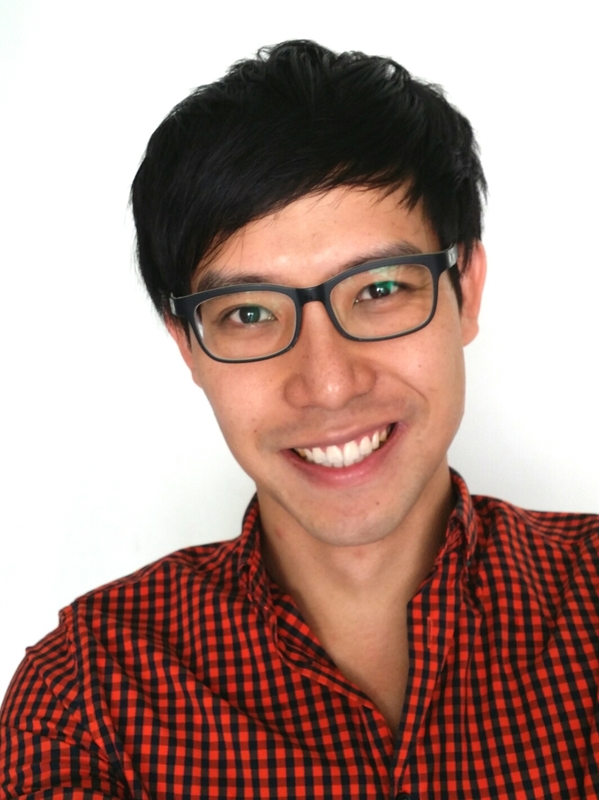 But for lower-income Singaporeans, where the poorest 30% households have to spend 105% to 151% of their incomes, they wouldn’t be able to do so – they simply do not have spare cash to invest or their living premises might be too small to let out, and that is if they own their living premises. 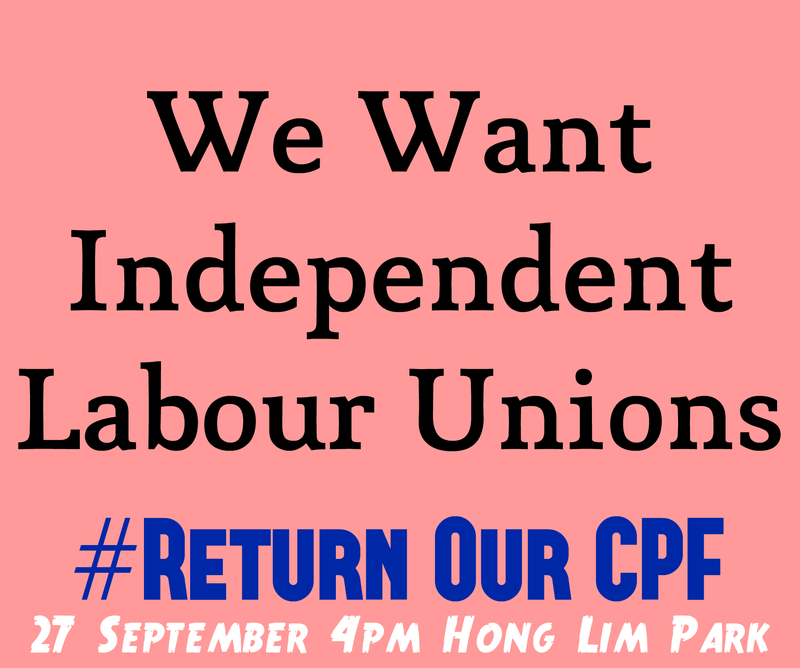 Yet, the question remains – why are Singaporeans forced to pay 37% of our wages into CPF – or the highest contribution rates in the world – yet our CPF is still one of the least adequate retirement funds in the world? 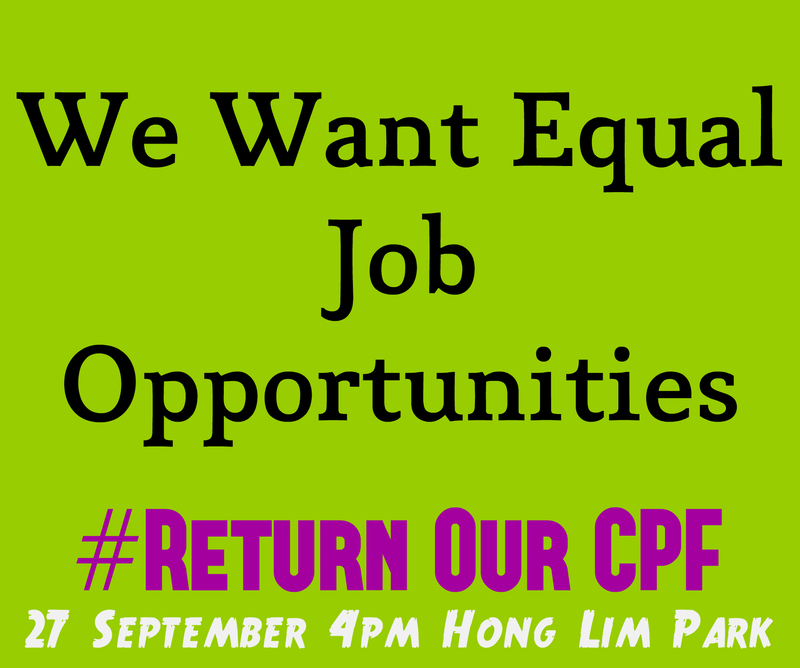 Why is the CPF not able to provide for Singaporeans’ retirement, when we pay so much of our wages into CPF?? It doesn’t quite make sense when the CPF Life payouts are only in the tens of dollars, and make up such a small proportion of a retirees’ income. 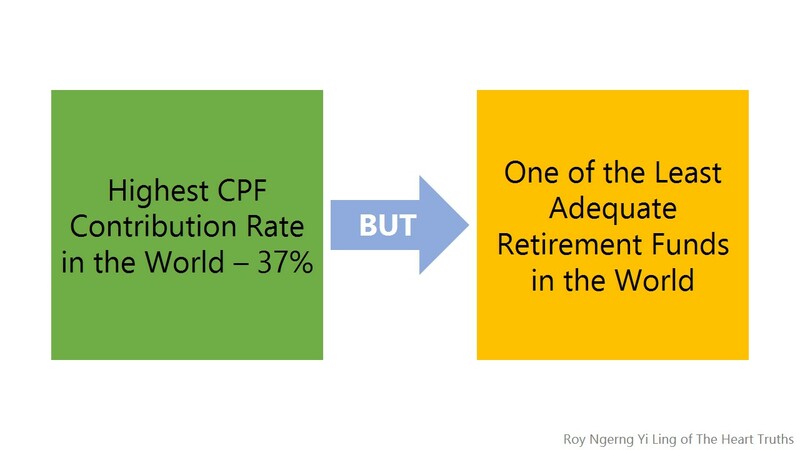 If we are paying so much into CPF and the highest contribution rate in the world, then logically, shouldn’t our CPF retirement funds be one of the most adequate retirement funds in the world? Why is it the other way round? Does this make logical sense? And if our CPF is no where near being able to let Singaporeans get $1,200 back monthly, then why does the PAP keep throwing out the $1,200 figure, which for all intents and purposes, becomes quite useless? 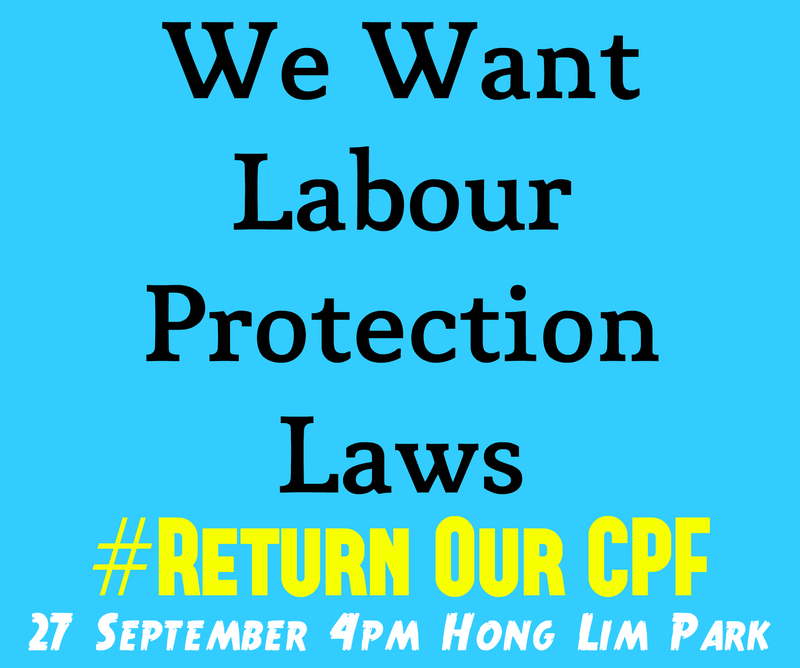 But more importantly, it is clear that Singaporeans simply are not able to save enough inside our CPF. And the more fundamental reason is because our wages and the CPF interest rates are too low, and thus we cannot save enough and our CPF cannot grow! 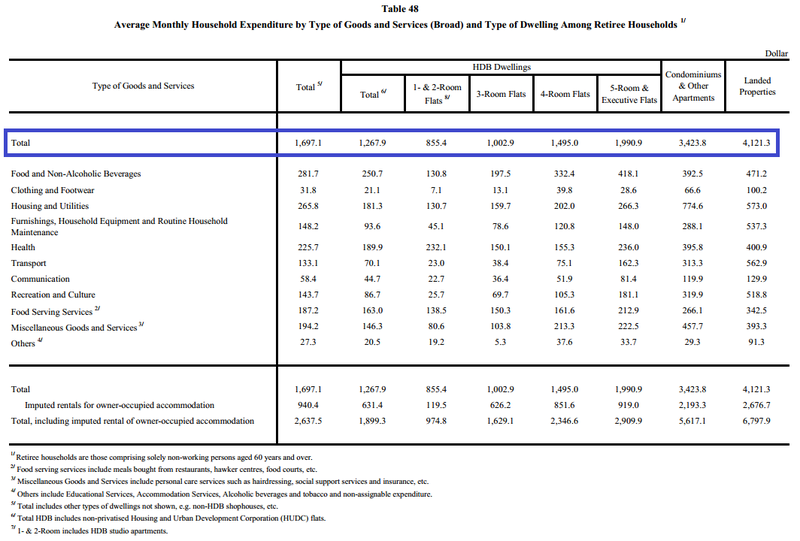 But things get even worse when you compare the household incomes with their expenditures. According to the survey, retiree households living in 1- & 2-room flats have an income of $647 but they would actually have to spend $855.40. They have to spend an additional $208.40 more than their income, or 32% more. This is also the case for retiree households living in 4-room flats who have an income of $1,233 but have to spend $1,495 (21% more) and for 5-room & executive flats with an income of $1,806 but have to spend $1,990.90 (10% more). 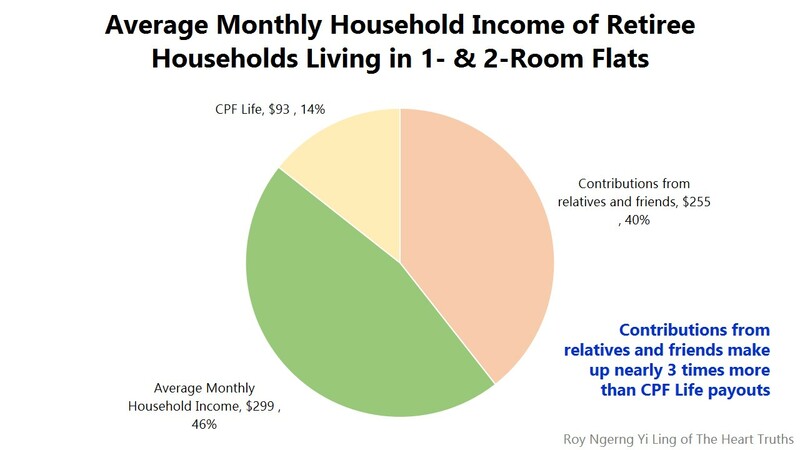 The only anomaly is for retiree households living in 3-room flats who have an income of $1,069 and spend $1,002.90. So, the question here is – for the poorest households, they have to spend 32% than their incomes. Where are they going to get this 32% from? 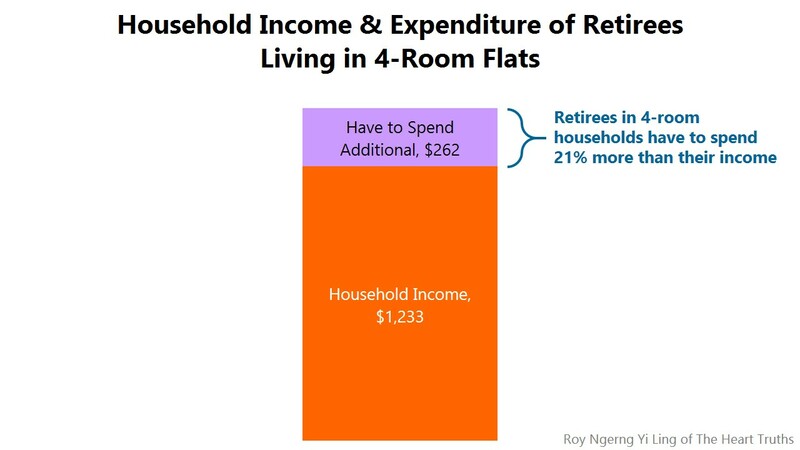 For retiree households living in 4-room flats, they have to spend 21% more than their incomes. 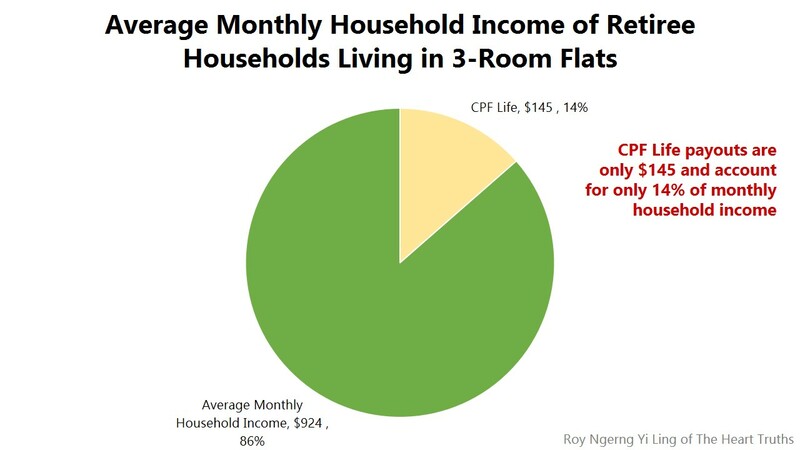 And for retiree households living in 5-room flats, they have to spend 10% more than their incomes. Where are they going to get the additional money from? Quite clearly, this means that the large majority of Singaporeans have to spend more than what they are able to earn. If so, this means that they would either have to forgo certain expenditure, say for basic recreation, but even for food, transport and health, or they would have to rely on donations for food, medical care and even cash donations. Otherwise, they might have to revert back to work, or have to forgo seeking medical treatment and choose to die, as many older Singaporeans have. This is why we keep seeing so many older Singaporeans work as cleaners, odd-job labourers, security guards and cardboard collectors. Meanwhile, the ministers earn millions every month while Singapore’s de facto minimum wage of $1,000 is the lowest among the highest-income countries. And meanwhile, we keep hearing more and more of how older Singaporeans have chosen to die instead of seek medical treatment or commit suicide because they do not want to become a burden to their families. Why Does the PAP Make Singapore So Expensive But Would Not Provide for Singaporeans and Would Let Singaporeans Languish While They Themselves Get Ahead? Is this the way that our elderly should be living in a country which has become the one of the richest in the world, as measured by the GDP per capita. Honestly, what is the use of earning all this money when the PAP keeps collecting so much revenue and profit but does not have the dignity or integrity to take care of Singaporeans and older Singaporeans? What is the use of making Singapore such an expensive place and earning all the profit when all the PAP is interested to do is to keep the profit for themselves, while letting Singaporeans languish. Which is no wonder why Singaporeans are now questioning the purpose of the PAP’s growth-at-all-costs strategy, and questioning the wisdom of letting the PAP be in government in the very first place. 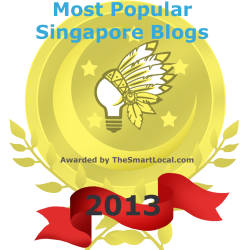 If their heart is not for Singaporeans, then is the PAP still what Singapore and Singaporeans need? 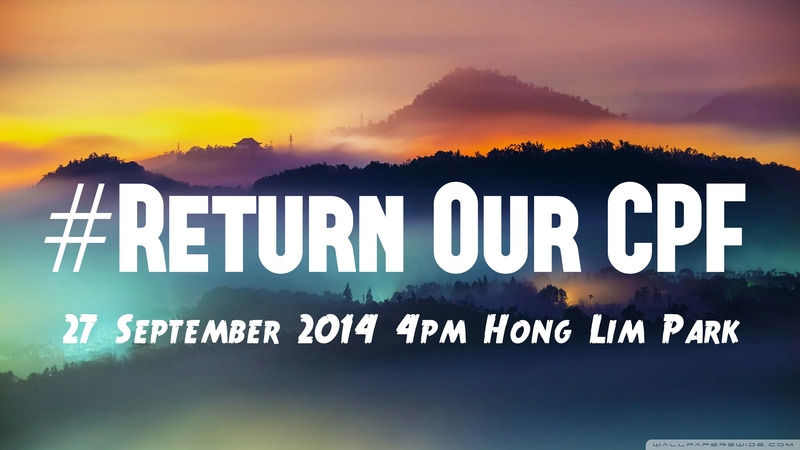 But the more appropriate question we need to ask is – is PAP still the right government for Singaporeans? If the PAP is only concerned about making use and manipulating Singaporeans’ labour to earn money for themselves, while leaving Singaporeans to die and fend for ourselves after that, then why should we be forced to toil for a PAP which is only interested in extracting our wealth for themselves? Shouldn’t we vote in a government which will return our wealth back to us, to allow all Singaporeans to share in our country’s growth and to allow all Singaporeans to live in dignity and with respect? I think the answer is clear – the PAP is no longer what Singapore needs. And Singaporeans would need to do the right thing to vote for a new government, to stand up to be elected and to allow Singapore to move towards an era of new and shared prosperity, for all its citizens and people. Come to Muse House. I want to discuss the length of your articles with you.